“Freeware” comes from the keywords “free + software” is the computer software that available for use at no cost. 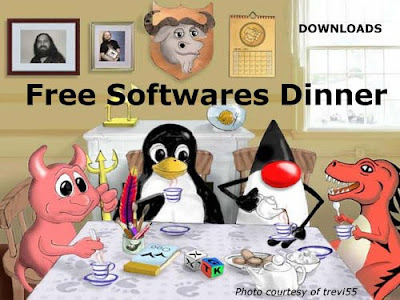 Talking about free software, there are plenty of software which do almost the same functions, but differ only in few features. Like we might use GIMP as an alternative for Abdobe Photoshop, AntiVir to replace Norton AntiVirus, or Open Office for Microsoft office alternative. When you search through those free download sites, normally more than one results will be shown, sometimes up to hundreds. Most of them are free, and some of them in trial version. Thus, the best way is to look for reviews from other users before download them. Though a review of software from experts will help up to understand the software and therefore give more insight about a particular software. The risks when you download free software from illegal websites, most probably the sofwares will come bundled up together with Viruses, Trojans or Spyware, which will tends to infect your computer. Download.com is the most popular software download website on the internet currently. It is an easy to navigate and widely used website for software review. Its domain name has a key advantage here as when you type to search for “download” in the search engine, this site will be the first to show in the search results. Besides, showing the review along with user opinion, other stat like how many times of downloads is shown too. The site has a very huge software archive. Sourceforge is a directory that contains the huge collections of open source software, probably the largest open source software and application directory on the Internet nowadays. Majorgeeks is a site consists of freeware and shareware software’s. A specify description of software along with rating and screenshot will be publicized. If software is a shareware it will also show the price for the licensing. Softpedia contains wide range of freeware with a big software directory especially for Linux OS, Windows, and Macintosh. This site is very useful to track latest software updates and new freeware. Filehippo is well known with its update checker that can help to check whether your latest version of software’s is installed and updated or not. By subscribe to the RSS feeds; you can keep track of all software updates easily from your email. Zdnet downloads is a friendly website functions to keep track for the latest software and reviews. SnapFiles’s homepage features the “Weekly Highlight” and “Top 100” for easy tracks of the popular software. Techsupportalert.com known as Gizmo’s freeware has huge categories of freeware software along with freeware reviews. The best thing is that it has a forum and you can subscribe to its feeds to keep track of latest trendy software. Ok, this site is special, why? “Because new is always not better”. This website functions as the software museum, thus you can download most of the older version software. Make sure you bookmark this website, since old software can become very useful at times when you need them.